With the heavy rain this past week and the dangerous current pulling hidden floating structure off the edges the river was very tough to navigate and doing much running to get to your favorite spots became a challenge. If you could put your boat in near your fish and avoid a lot of movement, you had a chance if your fish bite to have a good day. It wasn’t easy! We are getting into the jig time of year and as we progress further from winter to spring my choice is a Tight-Line football jig pulling along the bottom. 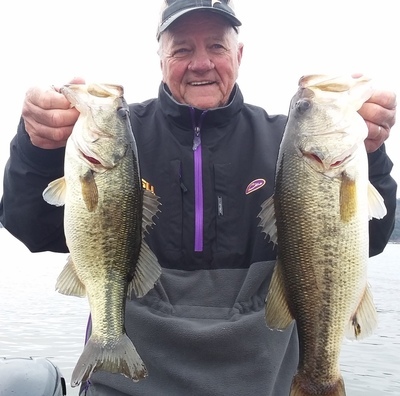 This bait along with the strong water current we are seeing, and the producer baits like SPRO Aruka Shad rattle baits, Picasso Spinner baits and Picasso umbrella rigs, Missile bait “48” stick baits that are catching fish will be the choice over the next few weeks on Guntersville. Fish 3 to 10 ft. water and finding the structure. Come fish with me no one will treat you better or work harder to see you have a great day on the water. Call us today we have guides and days available to fish with you! We fish with great sponsor products Lowrance Electronics, Boat Logix mounts, Ranger Boats, Duckett fishing, Vicious fishing, Navionics mapping, Mercury motors and more!